Among Cardinals general manager Walt Jocketty’s many successful acquisitions, including players such as Jim Edmonds, Scott Rolen, Edgar Renteria and Chris Carpenter, the most significant was the manager he hired, Tony La Russa. On Oct. 23, 1995, La Russa left the Athletics and joined the Cardinals, signing a two-year contract, with an option for a third, at $1.5 million a year. In replacing Mike Jorgensen, who had been interim manager after Joe Torre was fired in June 1995, La Russa was seen by Jocketty and team president Mark Lamping as the on-field leader needed to transform the Cardinals from underachievers to contenders. “The hiring of Tony La Russa to manage the Cardinals is a huge step in the rebuilding process of this organization,” said Jocketty, who replaced Dal Maxvill as general manager a year earlier. Said La Russa to the St. Louis Post-Dispatch: “I believe in high goals and I believe in big dreams. My dream real quickly for this franchise is to draw 3 million fans. And, as early as possible, to get to Sept. 1 with a chance to win. 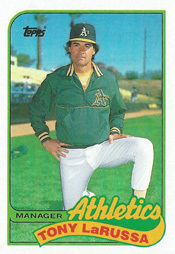 After he was fired by the White Sox, La Russa became Athletics manager in July 1986 and led them to three consecutive American League pennants (1988-90) and a World Series crown (1989). Before that, he led the White Sox to their first division title (1983). La Russa, 51, inherited a Cardinals club that had experienced consecutive losing seasons (1994-95) and hadn’t been to the postseason since 1987 when Whitey Herzog was manager. Said La Russa: “My statement to all Cardinals fans is that we’re going to have a hustling, aggressive ballclub that plays the game right. In October 1995, Jocketty and La Russa met informally in San Francisco to discuss the Cardinals job and soon after that Jocketty and Lamping met with La Russa in St. Louis. On Oct. 19, 1995, the Cardinals made La Russa an offer. He asked for time to consider it. Davey Johnson, former manager of the Mets and Reds, was a backup candidate if La Russa balked at the opportunity, the Post-Dispatch reported. In his book “One Last Strike,” La Russa revealed he was considering other offers. Jocketty had worked in the Oakland front office and was a big reason La Russa eventually felt comfortable going to St. Louis. La Russa also was able to bring with him coaches Dave Duncan, Dave McKay and Tommie Reynolds from Oakland to St. Louis. Jocketty delivered, acquiring impact players such as third baseman Gary Gaetti, shortstop Royce Clayton, outfielders Ron Gant and Willie McGee and pitchers Andy Benes, Todd Stottlemyre, Dennis Eckersley and Rick Honeycutt for La Russa’s first Cardinals team. After a rocky start, including a public feud with shortstop Ozzie Smith, La Russa led the 1996 Cardinals to a National League Central Division championship. La Russa managed the Cardinals for 16 seasons, achieved a franchise-record 1,408 wins and joined Billy Southworth as the only managers to win two World Series titles with the Cardinals. On July 27, 2014, La Russa and Torre, who achieved success with the Yankees after leaving the Cardinals, were inducted into the National Baseball Hall of Fame at Cooperstown, N.Y.